Elaine Economou is co-founder, President & CEO of MOVE Wellness Studios Fitness & Wellness, located in Ann Arbor, MI. She developed MOVE Wellness Studios’s vision as a place where people meet their fitness and wellness goals in a supportive, inspiring and challenging environment. She is in demand as a teacher, trainer, wellness coach and speaker for fitness and wellness and is committed to helping people live a joyful life in a fit and healthy body. She has developed strategic partnerships with St. Joseph Mercy Hospital, Probility Physical Therapy, University of Michigan and other area clinicians as the local trusted experts in fitness and wellness for clients of all ages and abilities. In addition, MOVE Wellness Studios has launched its own Pilates Instructor Training Program, a 450-hour program that prepares trainees to sit for the Pilates Method Alliance Certification exam. The MOVE Wellness Studios Instructor Training Program has created training, mentoring and growth opportunities for those interested in developing the high level of expertise needed to pursue a career in fitness teaching Pilates. Elaine is a mentor to staff and young dancers and athletes, helping them develop their career and is proud of the culture of learning, growth and compassion that has grown at MOVE Wellness Studios in its nearly four years in business. 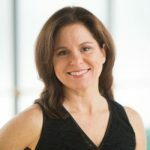 Elaine holds certification through the Pilates Method Alliance, STOTT PILATES and the GYROTONIC® and GYROKINESIS® Methods. She has received additional training as a Wellcoaches ™ trained Wellness Coach and TRX Suspension Trainer and Total Barre Instructor.